If you look at WWE as a product, very few moments have stood out and become a trending sensation. I'm not talking about those fake “trending” topics that WWE tries to convince you are going global to get you to jump onboard and tweet about in the middle of a show. I'm talking real moments that actually made a difference beyond that evening and have had a lasting impact. The Rock returning two years ago, Edge retiring for life due to injury, CM Punk's sitting shoot promo—all moments that hit YouTube and got massive replay value. While there's still a viewership tuning in every week, most longtime fans have given up on watching the boring three-hour extravaganza live. They instead wait to see if anything truly big occurred and then watch the seven-minute highlight reel the next day at lunch. Those moments come once every couple of months, before the WWE returns to what they were planning to do the following week. The Rock has become a tired replay of his former self with more muscles, Edge is gone, making only two appearances since leaving, and is now in the Hall Of Fame, and CM Punk won the title in Chicago to “leave,” only to come back after a week and lose it a month later. Fans have become accustomed, almost resentfully self-aware of the fact that they put in their time and money into a product that will disappoint them more times than astound and surprise them. But why? Why bother doing it? Why touch the stove when you know you're going to get burned? Because the nostalgia of growing up with this once-great product drives fans to hope for change and the idea that it could be great again. Yeah, we eventually got a CM Punk title run for 16 months, Daniel Bryan as a world champion, Cena losing for almost an entire year (while still being the company face and ambassador for Make-A-Wish), and Bruno Sammartino is finally in the Hall Of Fame. But when Wrestlemania 29 happened last weekend, we got what a lot of fans didn't expect: a return to the status quo. Cena is champion again, Triple H went over on Brock Lesnar and didn't retire, the mid and undercards looked weak and filled with too many former world champions, half the roster didn't even get a match, and the stories (or lack thereof) seem just as stale as ever. But the crowd on the episode of Raw may have started to change all that. All over the Internet, you'll find analysis and over-analysis of who made up the audience and how many “smarks” were there and how much New Jersey loves to act rebellious. But the simple truth behind last week's Raw was that the crowd showed its disapproval of the company the best way they could: vocalizing it in unison. For those of you who didn't see it, watch the replay video below featuring highlights from the show. You'll see the crowd loudly hate Cena's opening promo, cheer Mark Henry with his nickname from the '90s, cheered when on-air heels Wade Barrett and Dolph Ziggler won championships, and sat on their hands during the entrances for babyfaces. During just one match between Randy Orton and Seamus, the crowed started a soccer chant, cheered for the referee, commentators and ringside crew, chanted names of wrestlers not even with the company, and even started a wave. At one point they chanted the name of the late Randy Savage to Randy Orton, a wrestler with statistically fewer titles and accolades than Orton, and who even had a shorter WWF career (1985-1994) than Orton has currently in WWE (2002-2013). 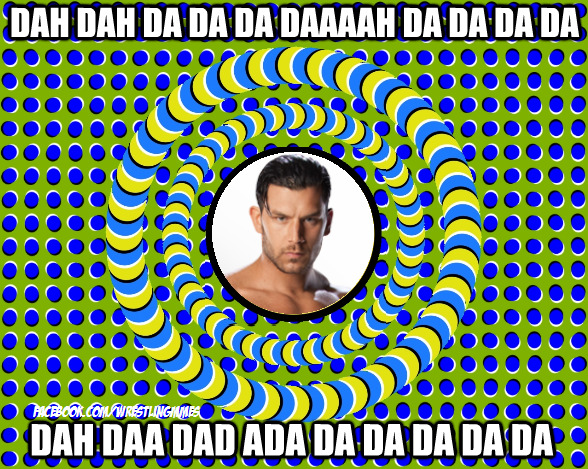 The greatest and and most surprising of these chants came when the recently debuting wrestler Johnny Curtis was introduced to the WWE audience as a dancing superstar known as Fandango (not the movie ticket company; stay focused). Whether it was the long entrance time, the many promos, the several failed appearances where he wouldn't wrestle until the ring announcer got his name right, or a combination of it all, the character struck a chord with the audience to the point where they started singing his theme song, a variation of “ChaChaLaLa” that's pretty damn easy to copy for the first 30 seconds. The crowd sang it during his match, sang it as he was leaving, sang it during the next two matches, and continued singing it in several fan videos showing the Jersey crowd continuing through the IZOD Arena as they headed into the streets, even honking their car horns to the beat as they drove off. Their singing even encouraged UK fans to buy the song on iTunes, putting it in the top 10 downloaded singles by week's end. Whether you appreciate the character or not, the Jersey crowd just helped give Curtis an audience chant less than two months into his television career. If you're the WWE staff and crew, normally you'd dismiss all this and move along, even though there were insider reports from the hotel WWE took over that many of the staff and wrestlers were pissed. But the reaction was so ridiculous that they had to acknowledge it on camera, and in that moment, the company willingly gave up control over the “universe.” No matter what wrestler it is, the writing staff and the performers usually can and will find ways to make you cheer or boo and manipulate your reaction. They do it not just in the arena, but by picking the schedule and locations as best they can. What touring performance or group do you know that goes from New Jersey to South Carolina, London, Ohio, Virginia, Oklahoma, Missouri, Alberta and Michigan, all within a two month period? Granted, they're hitting up cities in between, but that's just Raw's television schedule. Smackdown is just as convoluted. It's planned out to get the best reactions for television. (Its also why SLC has never had a Pay-Per-View event and only four television tapings in the past 15 years.) With that in mind, any city with a event meant for television should be salivating at the chance to carry on what Jersey started. Prior to the Attitude Era, when fans wanted to show their disapproval, they'd change the channel and give WCW or Monday Night Football their rating. With TNA not being on Monday nights and football five months away, there is no competition for WWE's rating, just the option to turn the TV off. Which, let's be honest, longtime wrestling fans, who make up most of the viewership these days, won't do. The only way the product will change and reinvent itself is through the diehard fans who are willing to shill out $20-$100 to see in-person. New Jersey fans showed that as long as you have a passion and are in unison, you can make a difference in the show. WWE is in a rut they won't admit to being in, and fans have taken notice beyond the “Internet crowd,” or the “smarks,” as they've been dubbed. It currently has the longest running roster of wrestlers since the early '90s with John Cena (11 years), Randy Orton (11 years), Mark Henry (16 years), Big Show (14 years), Chris Jerico (off and on for 14 years), Kane (14 years), Christian (15 years), Rey Mysterio (nine years), Triple H (17 years), and the rarely appearing Undertaker (23 years). Their current second-tier championship holders (United States and Intercontinental) lose on an almost weekly basis, devaluing the titles they hold. There is no real tag-team division, the Divas title (because WWE won't call it a women's division anymore) arguably has no value to women viewers and are just eye candy for men, and most of the stories you see have no payoff because they're started and finished within a month due to the exuberant and costly PPV schedule. You could literally walk away for a year, cold turkey, come back after Wrestlemania 30, and most of it will be the same as when you left. The fans tonight in Greenville, S.C., have an opportunity that if they don't capitalize on, we may never see again. If that group of fans could just coordinate their chants like Jersey did, speak their minds and take over the show, it could be the spark of change that the company so desperately needs to pay real attention to. Time and time again, you hear the hokey line in promos that “the fans make the superstars.” I say forget the superstars for now. All of the talent have contracts; whether they get cheered or booed has little effect in this era anymore. They really don't need the fans to make their careers—all the fans do is slightly help them decide whether they get on TV or not. The fans have a bigger role—they have the power to break the show and everything in it, killing the fourth wall, not giving the same old schtick any leeway, and ultimately changing the direction of the the company through their reactions. Imagine what would happen if an arena of 16,000 fans sat on their hands for all but three people and then made a chanting mockery of the rest, like Jersey did. If it happens and catches on, it will be something no live crowd will be able to let go of, as they'll want in on the game, too. The WWE Universe now has a genuine voice beyond text voting, Twitter hashtags and poorly filmed messages on Tout. Whether or not they're bold enough to step up, speak up and use it, will be seen tonight.